Real Workin’ Buddies Mr. Banks is your personal A.T.M. - Armored Truck Machine! 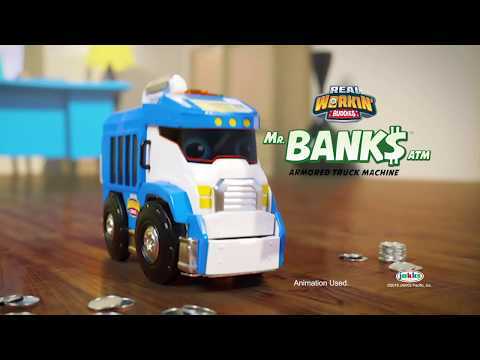 Mr. Banks counts, sorts, and stacks your coins. Plus, use his motorized mouth to eat your bills and keep them safe. Use his keypad & LCD screen to keep track of your savings. Kids & Parents will love Mr. Banks! He makes it Fun to Learn about Money, Savings & Math!